Isleton is a small town tucked along highway 160 between the towns of Antioch and our state capitol Sacramento. 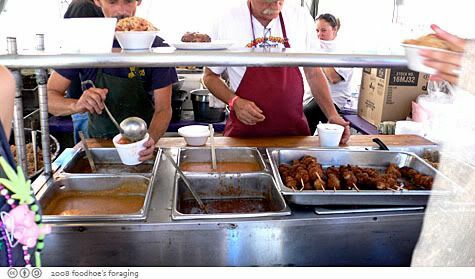 They have been hosting the Crawdad Festival since 1986 which has grown to include live music with bands playing zydeco, jazz and the blues, arts and crafts, a carnival area with rickety rides and a lot of fried and spicy food. According to their website, they expect to consume more than 24,000 pounds of spicy boiled crawfish over the three day weekend. 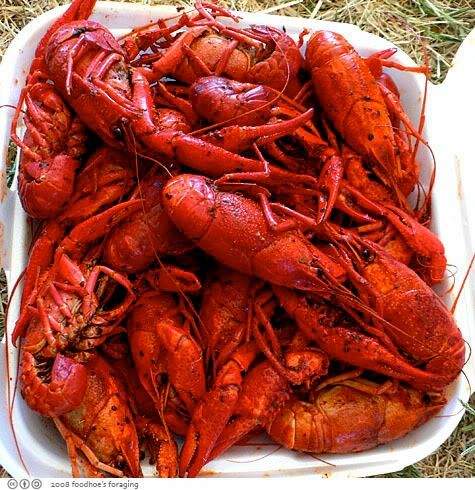 To tell you the truth, I have only eaten crawfish once before, years ago when an ambitious co-worker brought a bucket of them back from Louisiana when she traveled there on business. They were packed in dry ice and we reheated them up on the stove and enjoyed a fantastically messy meal where we must have plowed through at least one roll of paper towels. Food like this separates the serious eaters from the squeamish or meticulous dressers because it’s a primitive and grubby business. 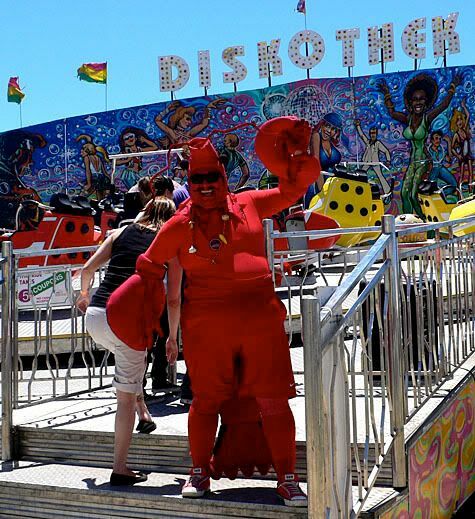 So yeah, I was really excited when P and DDR forwarded an email about the crawdad festival, especially after drooling over Passionate Eater’s posts about crawfish season in New Orleans. 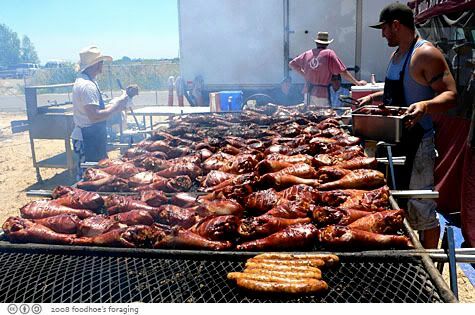 And so we drove out in hordes to storm the sleepy town of Isleton, with a population of 860, for food, more food and fun in the sun, as it is notoriously hot out in the Sacramento Delta. 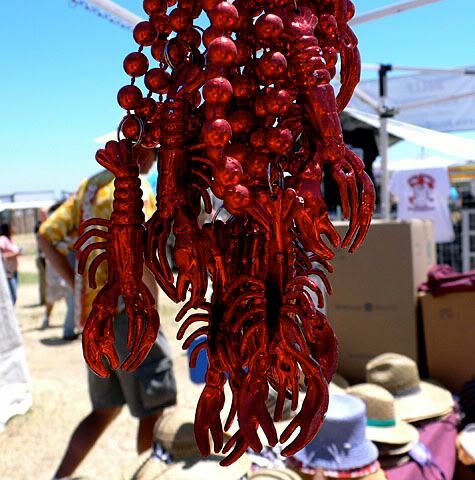 In the spirit of Pardi Gras, many vendors were selling festive beads, I loved these shiny red metallic strands with a crawfish dangling in front. 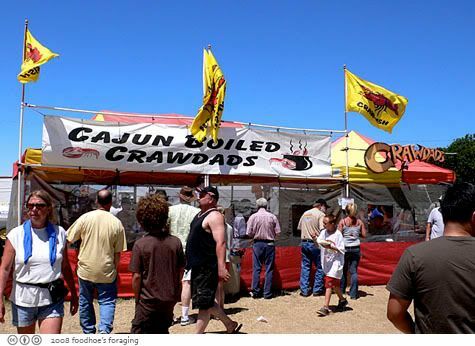 The longest lines were for the Cajun Boiled Crawdads, which sold two things: a small bucket or a large bucket of crawdads. We found a space in the covered pavillion next to the one of the zydeco bands and we hunkered down in the hay and dug in. We had nothing but a pile of paper napkins for utensils, as these are a hands-on affair. We pulled the heads off, sucked deliciously spicy broth from the tiny shell and then devoured the tails. 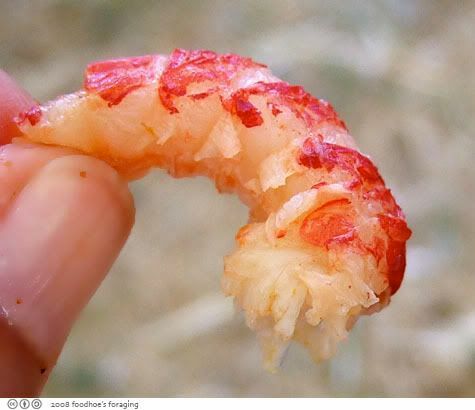 Wow, I am a big fan of the seemingly little lobsters, the fiery seasonings infused everything including my fingers! The tails seem disproportionately small and you have to twist carefully so that the little bit of custardy goo on the top of the tail remains intact. I am a one crawfish at a time eater, in fact I eat crab and shrimp like that too. At some level, I admit to having a general mistrust of my fellow diners, fearing that someone will make off with my hard-earned loot, but then I’m mostly impatient and just eat as I go. 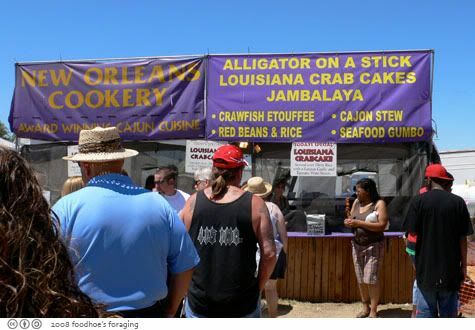 There was quite a line at the New Orleans Cookery and lots of people enjoying the Alligator on a Stick. The smells were incredible, it was hard to decide… too bad, they were out of crawfish etouffee. 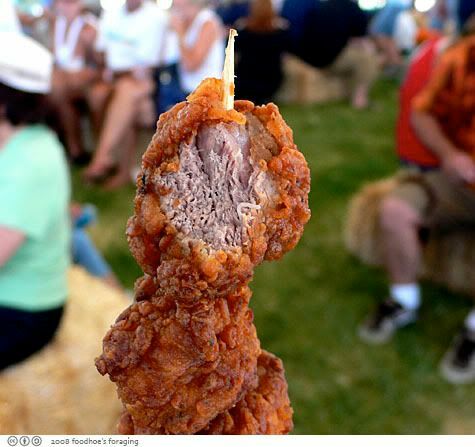 Here’s the Fried Alligator on a Stick, we all thought it tasted like chicken. 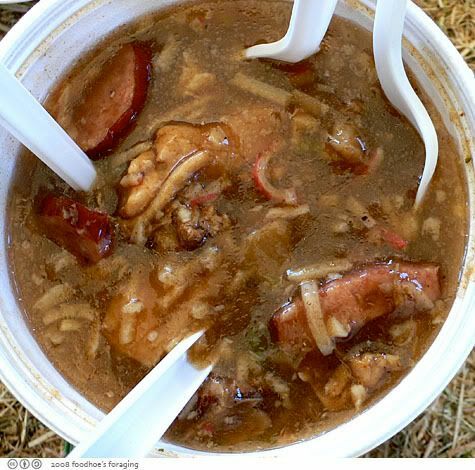 The Cajun Stew was a thick spicy brew with rice, sausage, chicken and next to the crawfish, my favorite dish from the festival. Anyone have a recipe? 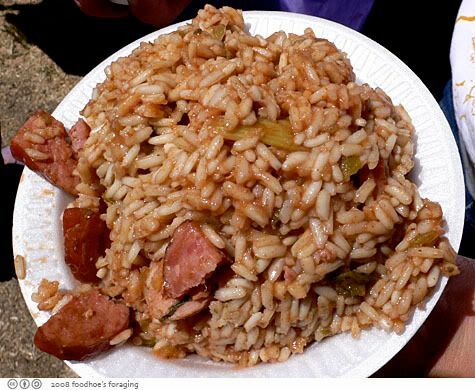 The Jambalaya was undercooked and dry and tasteless. Not only that, it was mostly sausage and one sad piece of dried out chicken. We decided to not waste valuable tummy bandwidth on this, especially since there were so many other delicious options out there. 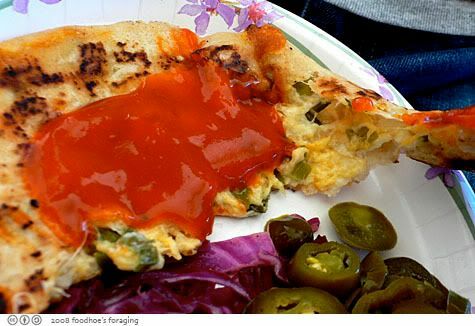 DDR and P went out foraging and came back with Pupusas that were filled with nopales and cheese and topped with a delicious chile sauce that I wish I had more of. 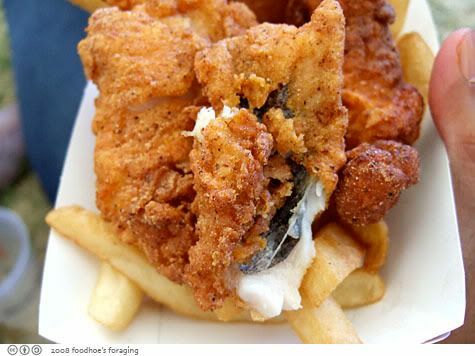 Fried Cajun Catfish and Chips, the breading was cornmeal based and reminded me of hushpupppies. 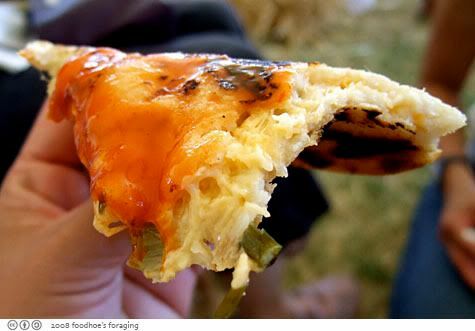 It formed a dense, crispy crust that had enough spice to make your lips tingle that went well with the rich meaty catfish and the spicy tabasco laced tartar sauce. 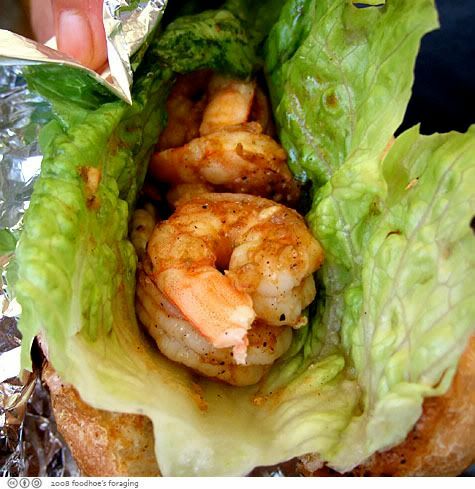 JT picked up a spicy Cajun Shrimp Po-Boy sandwich. The bun was big and dry so we just gorged on the spicy shrimp. 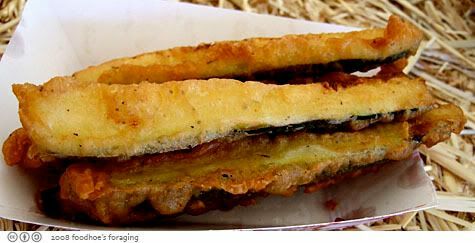 Fried Zucchini was piping hot, fresh from the fryer. We kept seeing people walking around sporting huge flintstonian Willie Bird Turkey Legs. 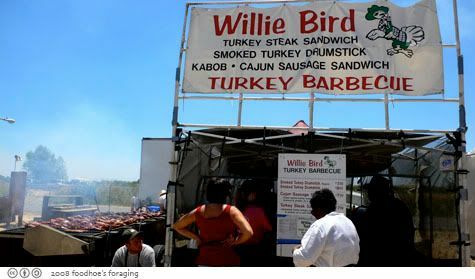 Willie Bird is a local source for free range natural turkeys raised in the hills near Petaluma and their barbecued legs looked and smelled delicious. All of us were riveted by the sight of someone walking by gnawing on the bone. JT got one to go for the ride home. Me, I wanted to try everything and knew that a turkey leg was just a big pile of meat and decided to pass. There were too many other interesting booths to explore and difficult decisions had to be made. I even had to pass on the foot long corndog, which I had never seen before. Grilled Corn was incredibly sweet and juicy. 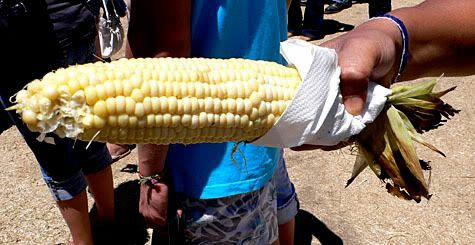 The corn was crisp and fresh tasting and barely cooked, but I actually prefer it that way when it’s the tender early corn. After all the spicy rich food, I went over for a Snowie cone, which had a refreshing mister at the window. 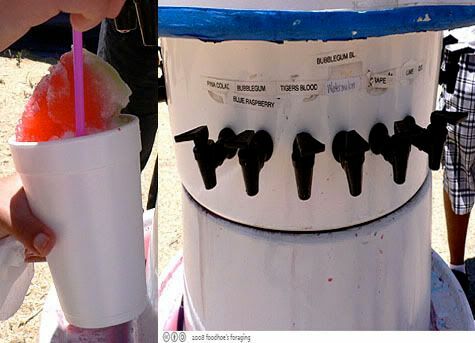 This was simply shaved ice in a cup and you serve yourself from the flavor station. The Tiger blood was a surprisingly delicious blend of Cherry with a touch of coconut juice, but with so many different spigots I ended up with a fruit punch flavored snowie. It was icy and refreshing and very, very sweet. It got me properly amped up on sugar, which was perfect as we were entering the carnival section with the rides and soon found ourselves in bumper cars smacking into the other cars with glee. 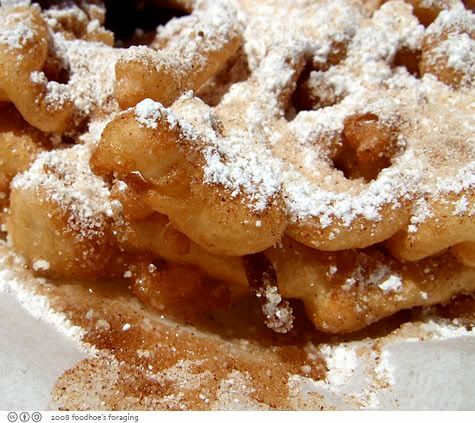 DDR had zeroed in on the Funnel Cake from the beginning and she ordered one on our final tour around the many food vendors. I snuck around to the back to see the funnelcake chef in action. We had one with a mixture of powdered sugar and cinnamon sugar, and I think it would have been better with a bit more goo, like whipped cream or ice cream. 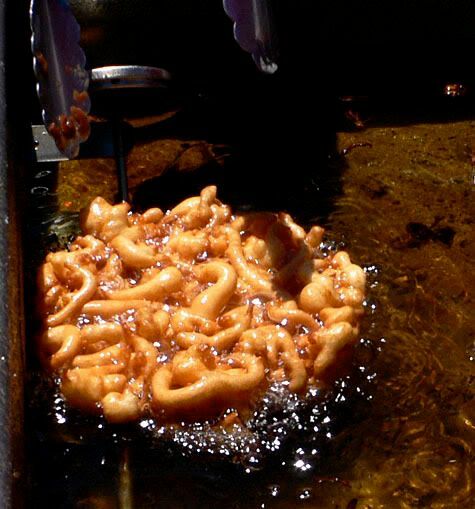 It was fresh out of the fryer and delicious on its own. It started to get crowded and the lines ridiculously long so we decided it was time to get on the road before the weekend traffic got underway. We stopped at a couple of fruit and vegetable stands, where JT bought a 20 pound box of cherries and then a quick stop at Top Dog in Berkeley for their famous hotdogs, which will be another post on another day. Hey FH – That was one huge “mess o’ food”! Hmmm, those crawdads look humongous! And you really did eat your way through Sacramento! Thanks for sharing the post because now I don’t have to drive all that far in the heat because your pictures made me feel like I was there. But then again, now I want some crawdads. 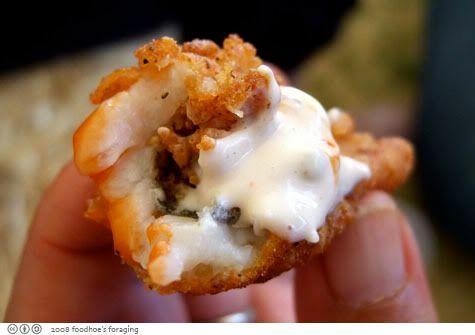 I have to find some in the Bay Area. Wow! 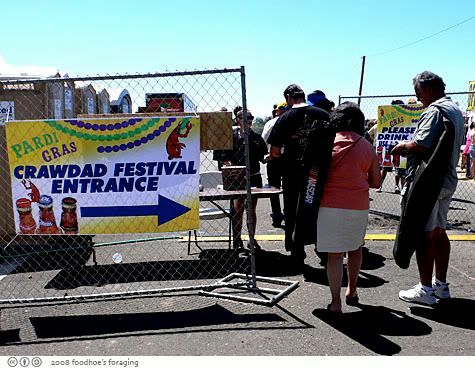 The Crawdad festival looks like it’s grown a lot in the last decade. The Cajun stew just looks like gumbo without the okra. Isleton had quite a Chinese population at one time, when they helped build the levees. There were vestiges of some buildings in downtown Isleton when I was there a decade ago. Wonder if they’re still around? You want old Chinese buildings? Drive up the river a few miles and wander through the town of Loch. There’s a local dive there that’s known for their steak sandwiches, called Al the WOP’s. Decidedly ordinary to be charitable but it’s historic. You want old Chinese buildings? Drive up the river a few miles and wander through the town of Locke. Looks pretty much the same as 100 years ago. There’s a local dive there that’s known for their steak sandwiches, called Al the WOP’s. Al’s is decidedly ordinary to be charitable but it’s historic. Wandering Chopsticks, This was my first visit and apparently it is huge compared to just a few years ago. I did see several old storefronts that had chinese signs, a Tong house, and a gazebo park with a chinese sign. So they definitely are keeping the cultural history up. please let us know how we can purchase crawfish from you. we are in the area. When is this festival? 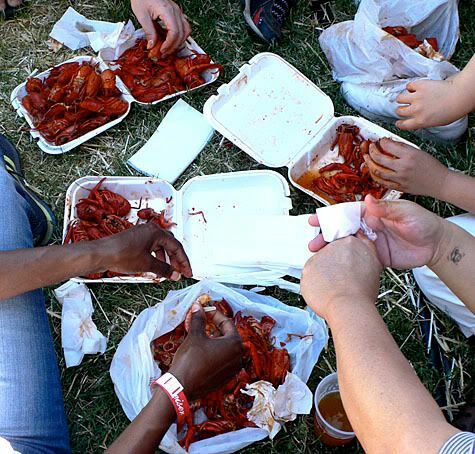 I’m from Louisiana and really miss the Cajun Food so I’d love to get more information about this festival and even where Crawfish can be purchased in Southern California? 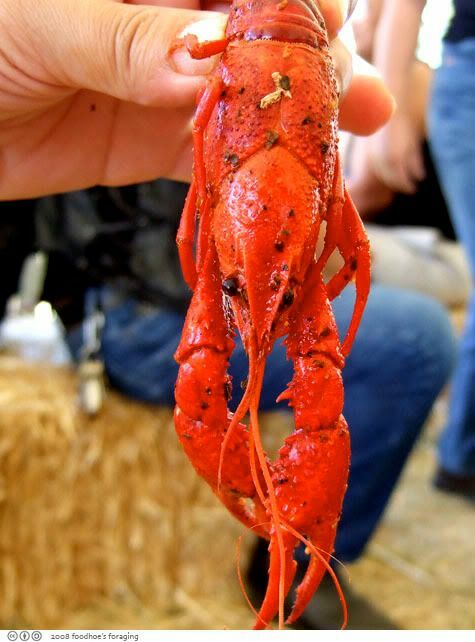 The Isleton Crawdad Festival has been moved to Red Bluff–it literally outgrew Isleton! See you there Father’s Day 2010. 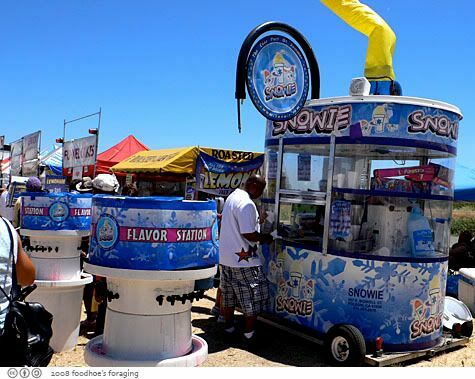 The same food vendors will be there–even New Orleans Cookery and their gator on a stick.